Let’s face it…filling out evaluations are a pain. Especially after a long conference or drawn out conversation with a customer service representative on the phone, it’s the last thing I feel like doing. And when I buy something at the Gap and they tell me I have a chance to win $1000 if I “just call the number on my receipt and tell us how we did”, fuggettaboutit! But I know first hand as a workshop facilitator and business owner how important evaluations are. 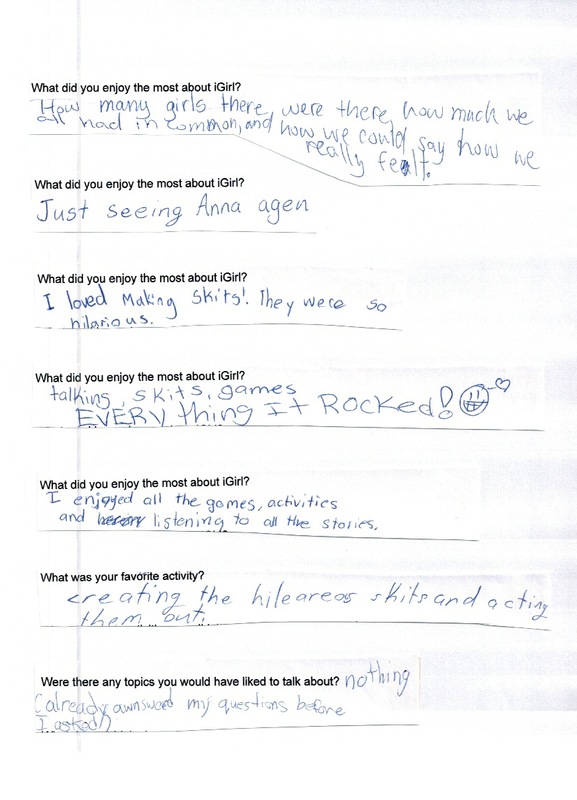 That is, I rely on the feedback of our participants to make our workshops as awesome as they can be. At iGirl, we explain to participants how important their insight is to us. After all, they’re the experts at what’s fun and engaging for girls their age! They’re always anonymous, and for the most part the girls take it very seriously. For as long as I can remember, it’s been a tradition for me to, after every workshop we do, sit in the car quietly for a few minutes before I leave the parking lot to read what participants had to say. Their comments are honest, hilarious and meaningful. While most of the evaluations are overwhelmingly positive, every now and then I read comments that are hard to take. I remind myself that it’s nothing personal, and that every comment presents an opportunity to do better. For example, after a workshop we did a couple of months ago, there was some feedback from a few girls that the 9-12 year old age range was too wide. That is, the older girls in the group felt that the workshop was too “babyish”. What?! 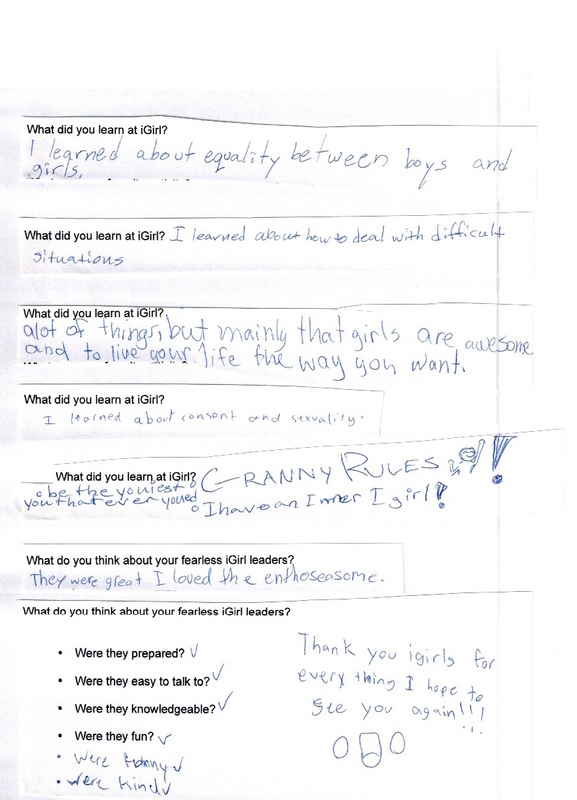 So, at our workshop last weekend, we asked participants to comment specifically on whether other girls their age would have found iGirl fun and age-appropriate (interestingly, there was an equal number of 9-10 year olds and 11-12 year olds in the group. The consensus (according to the evaluations) was that the age range worked well. But this is a question I and my facilitators will continue to ponder. How can we provide the most relevant, valuable iGirl experience for our participants. Are the issues faced by 9-10 year olds the same as those faced by 11-12 year olds? If not, what would it look like to separate them? For now, we’ve decided to keep the age range for iGirl as is. But thanks to the girls who brought this issue to our attention, we’ll have heightened awareness moving forward. And that’s the key, I believe, to a successful workshop: taking a close (and often uncomfortable) look at how we can be of highest value to our participants.